This analysis is by Bloomberg Intelligence analyst Mike McGlone. It appeared first on the Bloomberg Terminal. 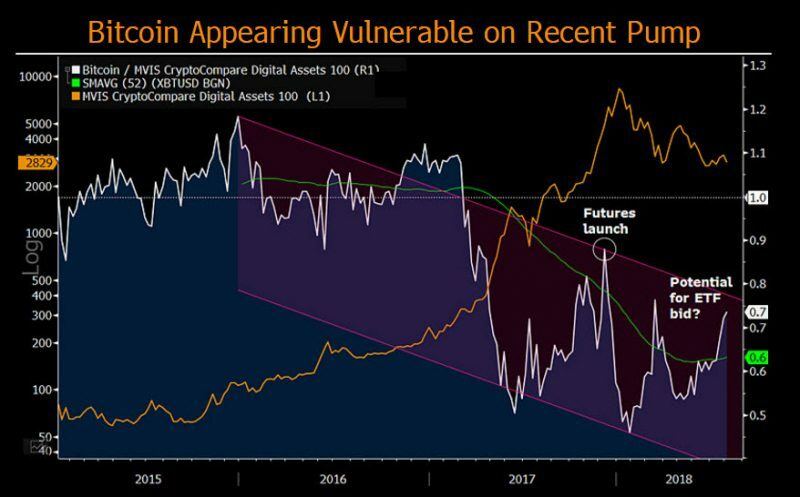 Bitcoin and the cryptocurrency market appear quite vulnerable early in August. The 2018 sell-rallies trend has shown little reason to reverse and there’s been another bounce. 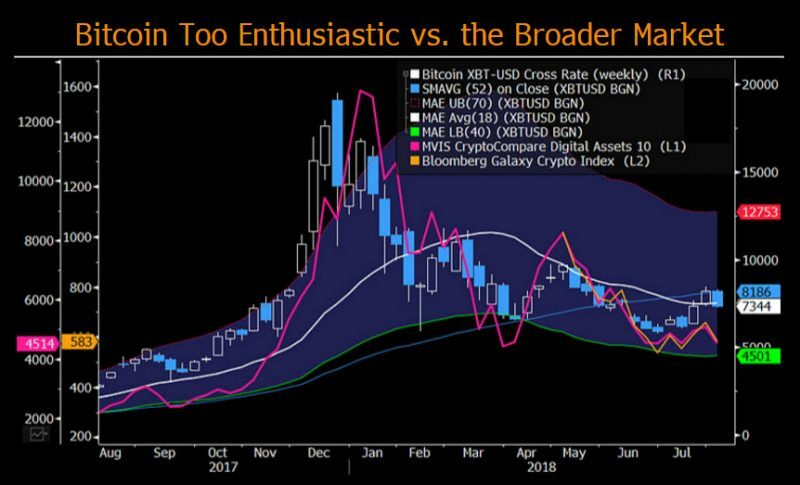 The potential for an ETF-supported Bitcoin in July boosted the price relative to the broader market and added risk. What is needed in the highly manipulated and speculative market are buyers more focused on the longer term, notwithstanding a proper peer-to-peer electronic cash system that favors more stable instruments. Banned from participating, China is a key missing link this year. In our view, a Bitcoin ETF this year is a long shot. Regulators are well-aware of the potential market impact, which should temper a one-off announcement. Supply, demand and price indications remain negative for Bitcoin and the broader market. In simple trading nomenclature, August should be considered do or die for cryptocurrencies. Greater price risks are down on the back of the speculative Bitcoin-led — and Asia-based — futures-related manipulation pump that was fueled by the potential of ETF approval. 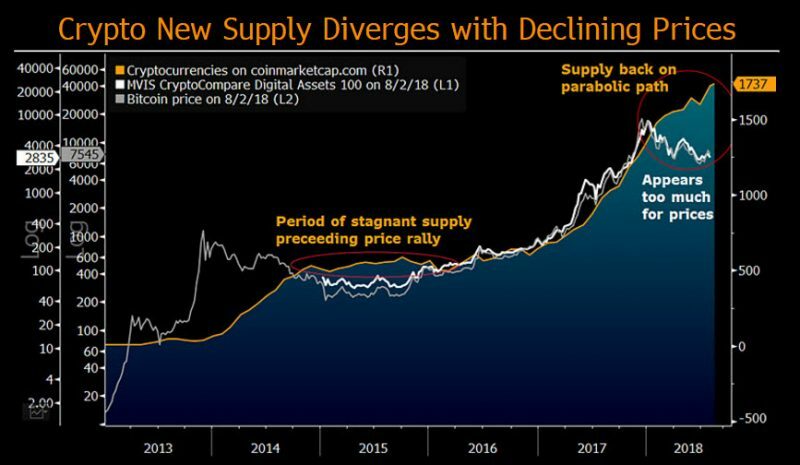 Rapidly increasing new-coin supply is keeping pressure on the broader market. Bitcoin appears excessively pumped. Since the end of June, BTC’s price is up about 25% vs. 8% for the Bloomberg Galaxy Crypto Index to Aug. 3. Speculation on the approval of the first U.S.-based ETF is a primary driver, adding to the market’s vulnerability if it doesn’t happen. Our take is it’s unlikely in 2018. Suspect futures trading on the Hong Kong-based exchange OKEx may have aggravated the July rally. BTC’s brief recovery to its 52-week mean may be providing false hope for underwater longs. Trading below the mean indicates most Bitcoin buyers over the past year are in the red. Following 2017’s historic frenzy, it’s likely the current hangover should mirror the most recent, from 2014-15, which remained below this level for over a year. BTC needs to sustain above $8,200 to indicate potential recovery. Change is coming. Sooner than you think. On October 16th in New York, we’ll take a deep dive into the technologies that are changing how we spend, save and invest. Rapidly increasing supply of new, tradable cryptocurrencies should continue to suppress broad price gains. The end of 2017 seemed to mark an inflection point of appreciating prices vs. excessively increasing supply. In 2018, the number of cryptocurrencies has continued to increase about 30%, contributing to a 60% decline in broader market prices. At a new high over 1,700 in the beginning of August, the average 12-month increase in tradable cryptos on coinmarketcap.com in 2018 is almost 800. Bitcoin appears as vulnerable as it was close to last year’s peak, especially if an ETF isn’t approved. December was the last time BTC reached a similar extreme vs. the broader market, coincident with the launch of futures. The network value-to-transactions (NVT) ratio remains far from support, but plunging addresses used — a proxy for demand — is stabilizing. It’s unlikely that the trend in Bitcoin underperforming relative to the broader market has reversed — it’s probably more a question of the extent of the bounces. Since the beginning of 2016, the MVIS CryptoCompare Digital Assets 100 Index has outpaced BTC. The December frenzy amid the launch of futures was the most significant BTC bounce but was widely expected. Speculation on the approval of a U.S. ETF is one driver of the recent BTC recovery vs. the market. Even if ETFs are approved, our graphic shows that the extent of the BTC spike puts it back near the vulnerable zone vs. the market. A primary issue with Bitcoin is it’s the first born, with potentially a similar fate as AOL. Numerous improvement forks and more than 1,700 new competitors have entered the arena in the past decade, about 70% of them in the past two years. The rapid decline in Bitcoin addresses used may be subsiding, indicating a similar move for price declines. This demand indicator has a tendency to leap with BTC price spikes, which makes the recent pump a bit suspect. 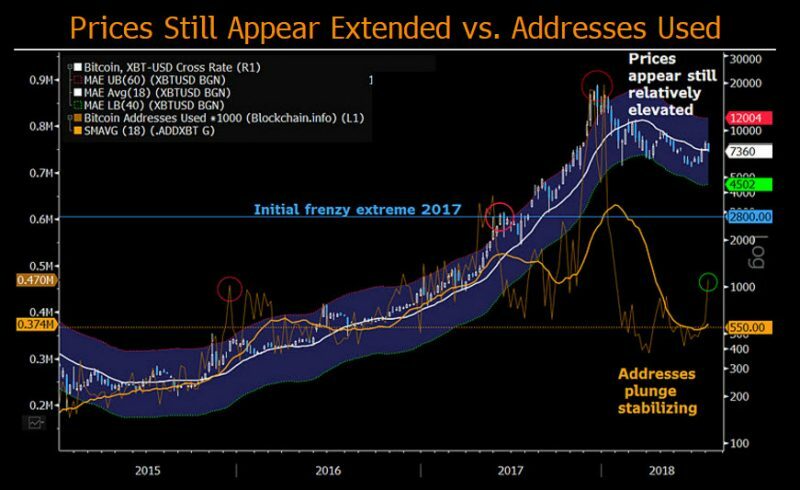 Our analysis shows the 18-week average a more consistent proxy for price trends, and this measure may be bottoming, albeit from levels last seen in 2016 when BTC averaged almost $570. The recent Bitcoin pump, which briefly brought it above its 18-week moving average, is at high risk of being a bear-market bounce. Sustaining above this mean, along with addresses-used bottoming, would indicate a potential price recovery. But what’s more common in bear markets — volatility and false-hope rallies — appear to be at play early in August.